Strong yet flexible, the foam coats any roofing surface, and expands and contracts as the temperature changes without losing its airtight seal or protective qualities. It is then covered with a white or other light-reflecting elastomeric coating that dramatically reduces roof temperatures and heat transfer to the interior. How does it do this? Unlike conventional roofing that is installed like a carpet, the sprayed foam flows into and fills every gap. There are no seams, and you can spray many areas that that are difficult to reach or cover sufficiently with other materials to eliminate the sources of leaks. If you have a roof with a lot of penetrations, the urethane roof process makes the job much easier than the conventional roofing process. With conventional roofing, you get a long run of rolled material, but when you get to a corner or penetration, you have to cut and splice the material to fit the space, then sew it all together. When it’s hot and uncomfortable, the installer may be in a rush or have a hard time piecing material in a crazy quilt around the odd angles, penetrations and hard-to-reach areas. Oftentimes, SPF roofing can cover the whole roof before an installer can do even one penetration. Whether approaching commercial or residential projects, insist on high-performance solutions, advises Armando Cobo, a nationally recognized designer, consultant and certified Green Building Instructor for the National Association of Home Builders. He advocates designing structures using processes that are environmentally responsible and resource-efficient throughout a building’s life cycle. Because of the material’s sealing and insulating qualities, a building with SPF roofing and/or insulation requires far less energy for cooling and heating. So it’s essential to allow for that when estimating HVAC tonnage. Several years ago, the architect for a large new hardware store being built in Fort Worth specified eight AC units, factoring in energy losses for a traditional hot tar-and-gravel roof. Ultimately, after DFW-Urethane sprayed the roof and walls, four of those purchased AC units sat idle. 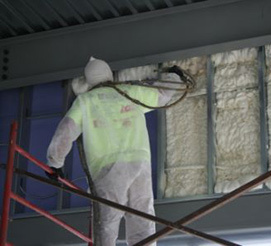 SPF roofing and insulation offers one of the most advanced building envelope systems on the market. It also works in concert with other structural building materials to support a continuous insulation envelope. It can be combined with high-density rigid polyurethane foam blocks for added insulation from below ground to the building’s roof, and with foam panels on building exteriors. Cobo uses rigid foam on the roof decking, with structural insulated panels installed on top of plywood or OSB boards, and the rigid foam sandwiched between the other materials. Rigid foam structural panels serve as effective “outsulation” and help prevent thermal bridging when used on top of OSB or plywood on the outside of structures. “Not only does it provide a strong outseal system, it creates the traditional appearance of 300-year-old stucco,” he adds.